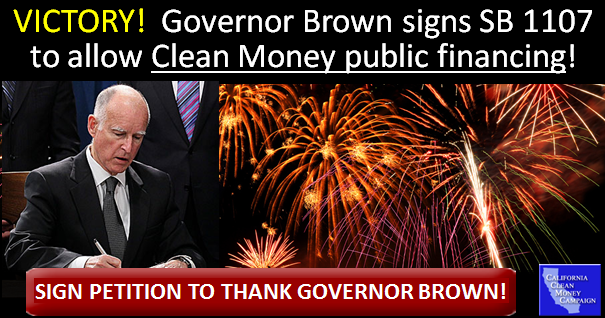 By now you've hopefully heard the incredible news -- Governor Brown signed SB 1107 to repeal California's ban on public financing of campaigns! A huge thank you to all of you who helped! This caps off easily the hardest fought and most important campaign finance victory in California in the 14+ years the California Clean Money Campaign has been working on the issue with our allies. Two separate initiatives, in 2006 and 2010, tried to overturn the ban and fell short. We always figured an initiative was our only option, because the legislative route requires 2/3 votes and no Republican legislator in CA in memory has ever voted for public financing. So that we were all able to get it done by getting five Republicans to vote for it still amazes me. I'm pretty sure that's the most contacts that Governor Brown has ever gotten on any bill since he's been in office, probably by far. And that's not counting op-eds, high-level contacts by national leaders, etc. Many many thanks to all of you who worked to help us get this into law! Organizations that joined CCMC and Common Cause in actively working to pass SB 1107 included California Church Impact, California Labor Federation, California League of Conservation Voters, California School Employees Association, CALPIRG, CARA, Courage Campaign, CREDO, Daily Kos, Democracy for America, Every Voice, Friends of the Earth, GMO Free USA, League of Women Voters of California, Money Out Voters In, People Demanding Action, People For the American Way, Progressive Democrats of America, Sierra Club California, Represent.US, and Voices for Progress. I'd like to especially call out CLCV, Courage Campaign, CREDO, Daily Kos, Friends of the Earth, LWV, and PDA for their multiple online actions over the last couple of months that helped give us the online oomph needed to get SB 1107's bipartisan super-majority votes and Governor Brown's signature. Thank you, friends! I'll also mention that SB 1107 author Senator Ben Allen (D-Santa Monica), chair of the the Senate Elections Committee and author of multiple electoral reform bills, is one of the best legislative champions for multiple campaign finance reform measures that California has ever had. I predict that more big things will come from working with him and other champions like Assemblymember Jimmy Gomez, Senator Bob Hertzberg, and a couple of our new Republican friends. There's plenty of work yet to be done in California, of course, including defending SB 1107 against likely court challenges and actually PASSING public financing systems now that the ban has been repealed -- not to mention other things like getting Prop 59, the Overturn Citizens United Act passed this November and finally passing the California DISCLOSE Act. But this was a crucial and heartening victory, and thanks again to everybody who helped make it happen! Woo hoo!!!! Didn't expect the old boy to do the right thing, but he came through! Congrats to everyone who worked this. It's path-breaking! Guess Which "Liberal" State Has 500 Laws Aimed at Oppressing the Homeless?